Controlled design allows you to say the most with the least, taking only what is needed and allowing it to be known. The newest offering in the JORD collection, the Hyde series, is a model of this minimalism. Cutting through the noise, the stark face, polished band, and precision quartz movement create a timepiece that will truly speak to you. 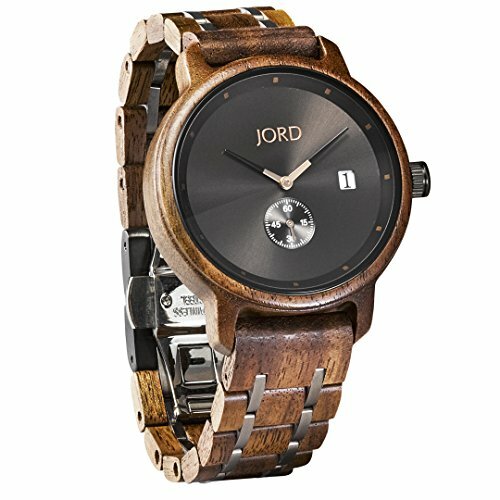 Elevate your daily wrist wear with a Hyde, Walnut & Black.JORD is the top-selling premium wood watch brand in the world. The Hyde series pairs modern minimalism with natural sophistication. Walnut wood offers dense grain lines across the band links and circular case. All wood is hand sanded and polished to a smooth, durable finish. A black face and hands sit beneath a scratch-resistant sapphire crystal. HAND-MADE CONSTRUCTION — features 100% natural Walnut wood, sustainably sourced from Eastern Europe. Genuine sapphire crystal. Battery-powered (silver oxide SR920SW) quartz crystal analog movement powers black and gold hands for ultra-accurate timekeeping. A deployment buckle with push button release secures the adjustable wood bracelet (removable metal pins secure links together). COMFORTABLE, NATURAL and DURABLE — Protected and sealed with tung oil (splash-proof). Unlike leather bands and low-quality metals, our hand-selected, premium hardwoods do not deteriorate or become brittle due to everyday wear. Wood colors are organic and naturally derived and do not contain any stains, dyes or harsh chemicals. Size can be adjusted by adding or removing links with at-home sizing kit, by a local jeweler, or by JORD (mail-in).